Abstract: Certain animal species in nature have visual systems that are sensitive to light’s polarization – a capability that is lacking in the human eyes. Our eyes cannot effectively sense and utilize the polarization information without appropriate external instruments. However, the species with polarization vision can detect this characteristic of image-forming light and can extract its information. Polarization is obviously an important feature of optical signals, and it can be affected by surface shapes, materials, local curvature and features, and relative location of sources and objects, and thus it can provide useful information about the observed scene and objects. What can one learn from this interesting ability of polarization sensing and detection in nature that has been evolved in certain biological visual systems? Of course, two general types of questions may be asked about this ability. (1) How do these species detect and sense the light’s polarization?, (2) How do they use this ability? The first general question points to the biophysical mechanisms of polarization detection in such visual systems – a topic that for some times has been a subject of interest for biologists, zoologists, and recently neuroscientists, physicists, and engineers. The second question aims at the functionality and advantages of this sensing mechanism in nature. In addition to the navigational utility of polarization sensing, it has been understood that some species use polarization vision to enhance their ability to detect and classify objects, to see otherwise transparent targets, and to break the camouflage, etc. Understanding the biophysical mechanism behind the polarization vision and reverse engineering its functionality and utility leads to exciting novel methods and techniques in sensing and imaging with various applications. Motivated and inspired by the features of polarization-sensitive visual systems in nature, in my group we have been developing various man-made, non-invasive imaging methodologies, sensing schemes and visualization and display schemes that have shown exciting and promising outcomes with useful applications in system design. These techniques provide better target detection, enhanced visibility in otherwise low-contrast conditions, longer detection range in optically scattering media, polarization-sensitive adaptation based on changing environments, surface deformation-variation detection (e.g., detection of finger prints on a smooth surface using polarization-based vision), "seeing" objects in shadows, and other novel outcomes and applications. In this talk, I will discuss several optical aspects of the biophysical mechanisms of polarization vision, and present sample results of our bio-inspired imaging methodologies. Biography: Nader Engheta is the H. Nedwill Ramsey Professor of Electrical and Systems Engineering, and Professor of Bioengineering, at the University of Pennsylvania. He received his B.S. degree in electrical engineering from the University of Tehran, and his M.S and Ph.D. degrees in EE from Caltech. Selected as one of the Scientific American 50 Leaders in Science and Technology in 2006 for developing the concept of optical lumped nanocircuits, he is a Guggenheim Fellow, an IEEE Third Millennium Medalist, IEEE Fellow, Optical Society of America Fellow, and the recipient of the Fulbright Naples Chair Award, NSF Presidential Young Investigator award, the UPS Foundation Distinguished Educator term Chair, and several teaching awards including the Christian F. and Mary R. Lindback Foundation Award. 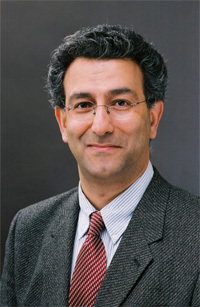 His current research activities span a broad range of areas including nanooptics and nanophotonics, metamaterials and plasmonics, bio-inspired sensing and imaging, miniaturized antennas and nanoantennas, physics and reverse-engineering of polarization vision in nature, mathematics of fractional operators, and physics of fields and waves phenomena. He has co-edited the book entitled "Metamaterials: Physics and Engineering Explorations" by Wiley-IEEE Press, 2006.